2018 was a big year for Fusarium wilt in the Sacramento Valley. I visited at least 20 fields with Fusarium wilt-like symptoms. 17 of these fields were positive for Fusarium wilt, with 2 positive for Fusarium crown and root rot. Other diseases encountered included Alfalfa Mosaic Virus, Verticillium wilt, Bacterial Canker, and Southern Blight. More information on Fusarium wilt can be found in the upcoming February 2019 Vegetable Crops Newsletter. 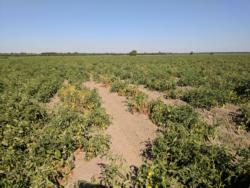 Southern blight is a destructive crown rot disease that rapidly kills tomato plants. The combination of late planting dates and record high temperatures in 2017 created unusually favorable conditions for the pathogen in the Sacramento Valley (C. Swett). The objective of this research was to quantify southern blight spread and impact in annual rotations in the region. Nine fields in Colusa County were sampled in May 2018 to determine baseline southern blight levels in the soil. These fields were previously in tomato with confirmed southern blight in 2017. Rotational crops in 2018 were corn and sunflower. Sunflowers (hosts for southern blight) were checked for symptoms every two weeks starting in June 2018 once the outside temperature reached 90°F for seven consecutive days, but no symptoms were observed. The fields were sampled again in August and September 2018 to determine if southern blight levels in the soil had increased. The Swett lab analyzed the soil samples for southern blight sclerotia. We recovered viable southern blight sclerotia from 3/9 fields in May 2018 and 7/9 fields in September 2018. All of the sunflower fields increased in number of sclerotia and the only decreases were found in 2of the 5 corn fields. Southern blight has not proven to be a large issue in 2018 since environmental conditions were not ideal for disease development, though it still remains a concern in our area if future growing seasons resemble 2017 conditions. Sunflower is not recommended as a rotational crop for southern blight infested fields, because it is a host plant. Cassandra Swett, Field and Vegetable Crop Pathology Extension Specialist, and Agronomy Advisor, Sarah Light, are collaborators on this project. Attract-and-kill traps were set up in 8 fresh-market cantaloupe and honeydew fields in the Sacramento Valley in July 2018. These traps were modeled after a successful cucumber beetle trapping study done by Lincoln University in Missouri. These gallon jug traps contained a floral-based lure to attract the beetles and an insecticide-treated net to kill them. Unfortunately, the traps have had poor success in catching cucumber beetles, even though beetle pressure was severe in the cantaloupe fields. This is likely due to the large scale of production in our area and not having enough traps in each field. The traps will be tested at a smaller scale in 2019. 2018 wrapped up the 1st year of a 3-year statewide Healthy Soils Demonstration Project supported by the CDFA. This project includes a cover crop demonstration and research site on a farm in Sutter County in addition to two other sites statewide (San Joaquin and Merced County). We are evaluating the impact of cover crops to soil health and annual production in the region. 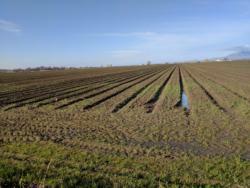 We have taken baseline soil samples at our site in Meridian, CA, which was previously planted to wheat. After compost application, we planted vetch cover crop. 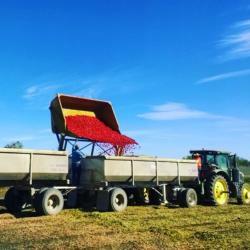 Our plots consist of a control (no cover crop), a low seed rate of the vetch, and a high seed rate of the vetch. The next two years of the project will include a tomatoes, vetch, and corn. We will take soil samples each year in addition to looking at pest pressure from diseases, insects, and weeds. Greenhouse gas emissions and infiltration are also being evaluated throughout the project, specifically before and after “events” such as rainfall, irrigations, fertilizations and tillage operations. Sarah Light (UCCE Agronomy Advisor), myself, and our grower cooperator ran a very successful field day in early December about this project, cover cropping and soil health. We will host another field day in 2019. I started my position as the Area Vegetable Crops Advisor in April 2016. I am continuing to develop and implement a multi-county-based extension and applied research program focusing on the priority needs of clientele in the area of vegetable crop production systems in Colusa, Sutter and Yuba counties (headquartered in Colusa). My program focuses on pest management of insects, diseases, and weeds. The main vegetable crops grown in Colusa, Sutter and Yuba counties are processing tomatoes, cucurbits (melons and squash), and seed production, with minimal vegetable production occurring in Yuba County. In the state of California, processing tomato production accounts for 96% of US production. Processing tomatoes are one of Colusa County’s top agricultural commodities, a county also home to two tomato processing plants. Processing tomatoes rank 5th in Sutter County for agricultural commodities. California ranks first in the country for fresh-market cantaloupe and honeydew production. Sutter County is one of the top honeydew producing counties in California. 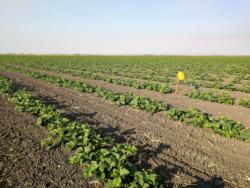 Cantaloupe production is still relatively new in the Sacramento Valley and has increased in the last ten years. 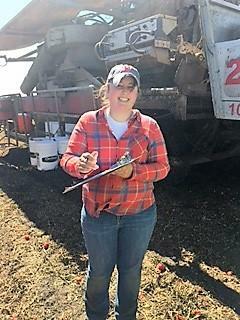 -Area Agronomy Advisor, Sarah Light, and myself will begin Year 2 of our CDFA-Healthy Soils Demonstration Project where we are implementing a winter vetch cover crop at two rates in a wheat-tomato-corn rotation. The vetch was planted in winter 2018/2019 and tomatoes will be planted spring 2019. -I will be testing a method to determine the effect of flood irrigation in rice production to Fusarium wilt of tomato in the Sutter Basin. This will hopefully contribute to a long term project looking at different irrigation strategies in crop rotations and how it related to Fusarium wilt levels in tomato. -I will also be comparing finger weeders to standard cultivation equipment in an organic processing tomato field. -For melons, I will be evaluating insecticide efficacy against cucumber beetles at a research farm on the UC-Davis campus. For questions regarding vegetable crops, please contact Amber Vinchesi in our office at 530-458-0575, or by email at acvinchesi@ucanr.edu.